Apparently I am now a grandmother, fortunately my 1st grandchild is a very sweet kitten named Sakiko. I am not particularly a cat person, primarily because I am more a bird person and seldom the twain do meet without tragic consequence. Sakiko is however a very sweet member of her species. Her new mother, my daughter Domi is besotted. Domi spent a good chunk of yesterday making cat related online purchases. Domi tore herself away from her baby to spend yesterday with me (my birthday), during our day we popped into the fabric shop for ribbon as Domi had a cute idea. Domi is a school teacher, during her studies on child development she came across an idea for baby stimulation, which is to stitch ribbons to the finger tips of a glove and wiggle the ribbons overhead while baby lies on its back. Now with a playful kitten in the house she decided that she wanted to convert this idea to a kitten toy. 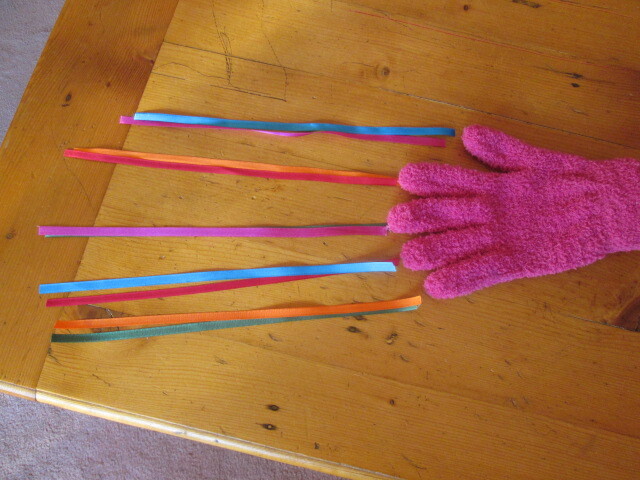 We chose 5 colours of 6 mm ribbon and bought 1 metre of each (for 2 gloves, as another kitten is joining the family soon), this converted to 4 strands of 25 cm per colour, 2 strands per finger. Domi then arranged the 25 cm strands on the gloves with 2 ribbons per finger. Initially I planned to hand stitch the ribbons onto the gloves but decided that a tight zig zag stitch on the sewing machine would be stronger. This resulted in the glove fingers being a fraction shorter but didn’t make a difference to the fit on knitted gloves. On returning home Domi phoned me to say that Sakiko loves the glove. 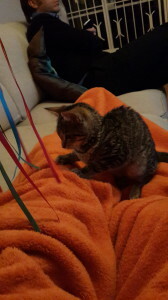 I’m pleased that her idea turned out to be a very successful toy for her kitten. 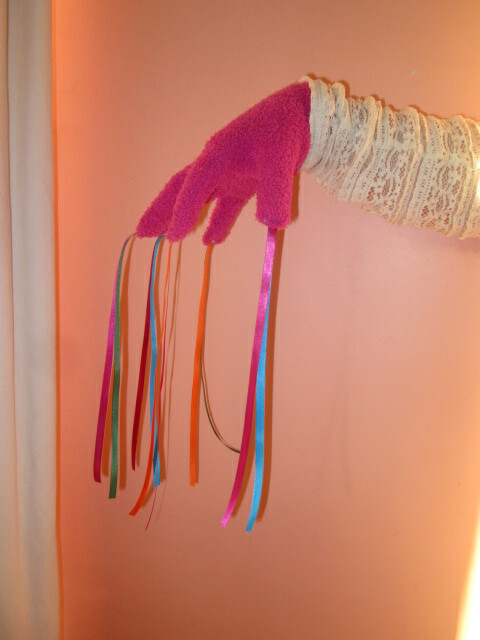 After making the gloves, we decided that 30cm ribbons may have worked a little better but it’s a hit anyway. I asked Domi to take some pictures, this one is the clearest, the ones where she is attacking the ribbon were a bit too blurry to use. Happy Belated Birthday – hoping that your birthday was everything you wished it to be.